How does US 111 work? 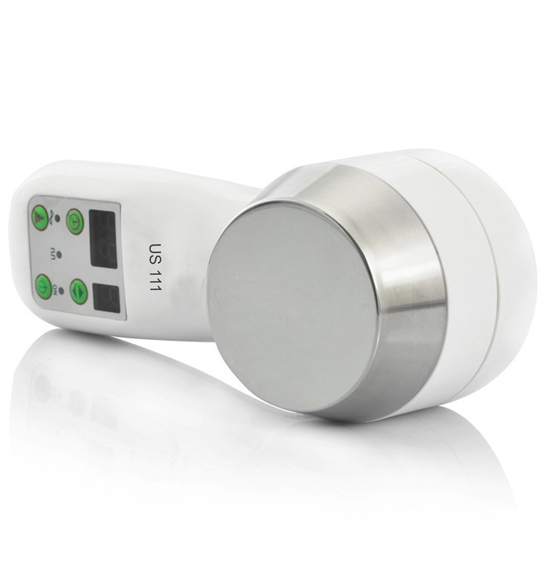 The transducer head of the US 111 portable ultrasound converts electrical energy into the strong vibratory sound waves of ultrasound therapy.The US 111 portable ultrasound also allows you to focus ultrasonic energy on a musculoskeletal pain – creating a therapeutic effect & inducing soft tissue healing. The generated pulse of low frequency ultrasound waves causes micro-vibrations in the tissues, generating deep heat (diathermy), for the treatment of pain, joint contractures and muscles spasm. The user-friendly ultrasonic therapy expedite healing by improving blood circulation & oxygen flow and increasing tissue relaxation & scar tissue breakdown for increased mobility in the ligaments and joints. What does US 111 cure? Bursitis: Knee Bursitis, Hip Bursitis. We’ve discovered that using cold therapy in combination with US 111 therapeutic ultrasound speeds healing and reduce pain FAST! Use US 111 ultrasound machines to treat the affected area for 10-15 minutes daily. To find out more about how US 111 works, visit our F.A.Q.’s page. For new injuries, you must have to sit & lie down as much as possible. Even with old injuries or aches and pains that you’re trying to cure, you need to allow your body to rest. Cold Therapy. Chill your Ultracool Pack and apply for 10-20 minutes, once or twice a day, to reduce local swelling and pain of new injuries. Compression Therapy. Simply wrap a bandage or cloth firmly around the ice pack to keep it in place & compress the injury. Compression helps preventing further swelling & damage from occurring. When sitting or lying down, you should try to elevate your injury above heart level, if possible. The elevation helps decrease and prevents further swelling. Raise the affected limb as often as possible. In total, treating with ultrasound & cold therapy will take you only 20-35 minutes a day. So next time you’re sitting down to watch a TV show, take out your US 111 machine & cold pack and heal the injury while relaxing at home! 1. Is the US 111 device right for me? More and more, we come across reports of complications from & addictions to pain killers and other pain medications, that is why the use of home medical devices for pain management is on the grow. 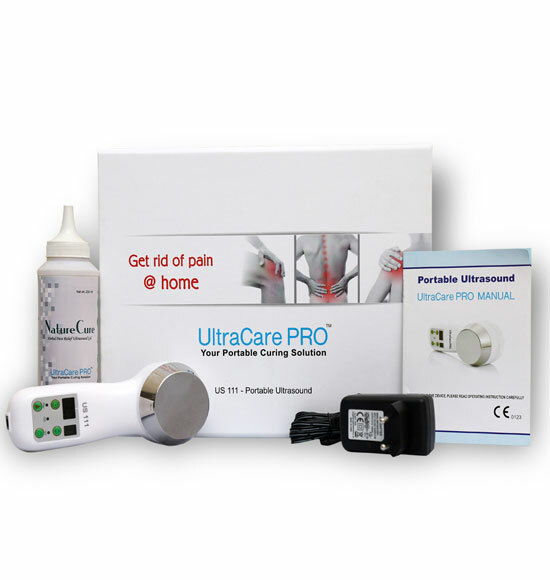 If you’re suffering from chronic pain that keeps you dependent on daily anti-inflammatory & pain medicines, the US 111 portable ultrasound is able to relieve your pain to the point that you no longer require these medicines, or their negative side effects. Ultrasound therapy with the US 111 is a much more natural pain relief modality than pain killers that only mask your injury & hide the pain, instead of actually healing the problem. Conventional ultrasound machines requires large stationary devices with transducers & messy gel that can only be applied by a skilled therapist. This restricts use of ultrasound as a therapeutic modality which decreases the overall frequency of treatments & consequent effectiveness. The handheld US 111 makes ultrasound treatments completely portable & gives you the ability to treat at home or on the go. 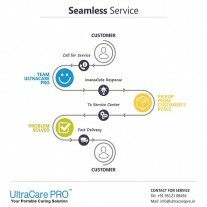 Traditional ultrasound therapy treatments can be obtained from most Doctors and Physiotherapists. What you may not know is that these medical professionals are also our customers. 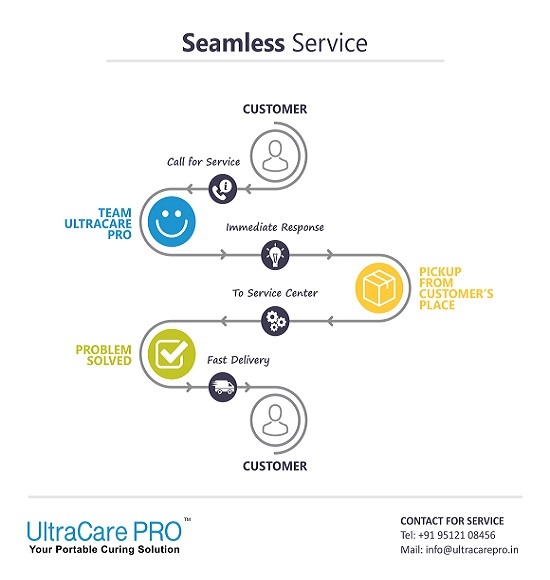 Doctors and Physiotherapists use the US 111 portable ultrasound in their offices to treat patients as well as to treat their own injuries and chronic pain at home. 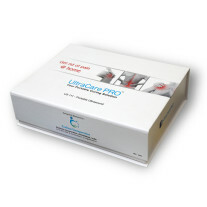 They recommend the US 111 portable ultrasound because it is sturdy, effective and easy to use. 1Do not use over or near bone growth centers until bone growth is complete. 2Do not use over a healing fracture. 3Do not use over the eyes. 4Do not use for patients with implanted neurostimulation systems because tissue damage can occur at the location of the implanted electrodes resulting in severe injury or death. This can also damage the system components. 5Do not use to treat malignancies nor in the region with malignant tumors. 6Do not use for patients with demand type cardiac pacemakers. 7Do not use for someone who is pregnant. 8Do not use over ischemic tissues in patients with vascular disease where the blood supply would be unable to follow the increase in metabolic demand and tissue necrosis might result. 9Do not use over the carotid sinus nerves or arteries, laryngeal or pharyngeal muscles. 1 Do not use on patients with hemorrhagic diatheses. 2 Do not use over an area of the spinal cord following a laminectomy, i.e., when major covering tissues have been removed. 3 Do not use over anesthetic areas. 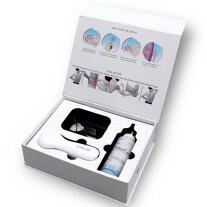 5 When using ultrasound, keep the sound head moving while maintaining contact with skin. 6 If treatment become uncomfortable, inform or contact your physician. 7 Do not immerse the Portable Ultrasound in water or other solvent. 8 Do not use over metallic implants, especially prostheses with a cement-matrix. 910 Minutes interval is recommended between repeating treatment cycles to prevent damage to the device & allow for the cooling of the precision head probe. 2. How does US 111 work? The transducer head of the US 111 portable ultrasound converts electrical energy into the strong vibratory sound waves of ultrasound therapy. The US 111 portable ultrasound also allows you to focus ultrasonic energy on a musculoskeletal pain – creating a therapeutic effect & inducing soft tissue healing. 3. How to use US 111? This 8 level ultrasound pain therapy device is extensively used for physical therapy and rehabilitative purposes. The US 111 portable ultrasound device consists of a lightweight handheld machine connected to an AC adapter, and generates ultrasound waves to the desired part of the body. This home ultrasound device can be taken anywhere safely with its strong protective carry case. 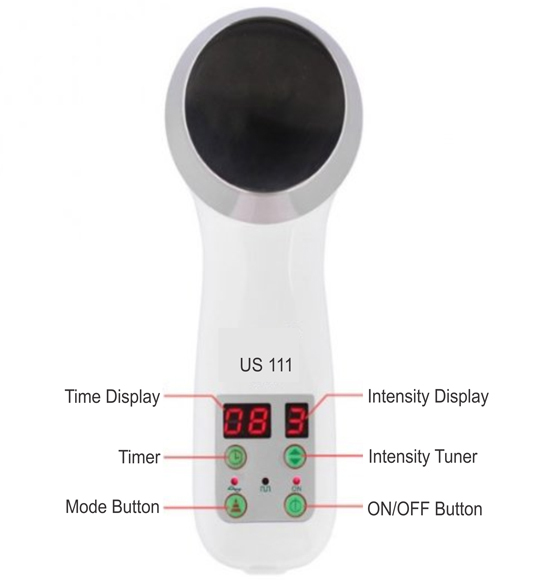 To use your US 111 ultra sound machine, it is recommended that transmission gel or conductive lotion be used to allow the sound waves to penetrate into the body. 1 Connect AC power adapter to the electric socket. 3 Turn on the power switch & look for the blinking power light on device (It shows that adapter is running correct), then select the treatment intensity, treatment time, treatment mode setting according to your requirement. 4 Place the transducer head on the area where conductive gel was applied & constantly move the ultrasound head in small circles (~1 inch per second). 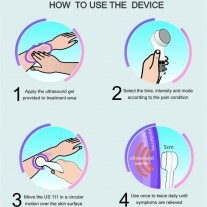 5 The US 111 portable ultrasound device automatically powers off after the selected treatment time. 6 After treatment, clean the skin & ultrasound head off with a wet cloth & be sure to leave the unit off for 10-15 minutes before going to another treatment. 4. For how long & often do you use? 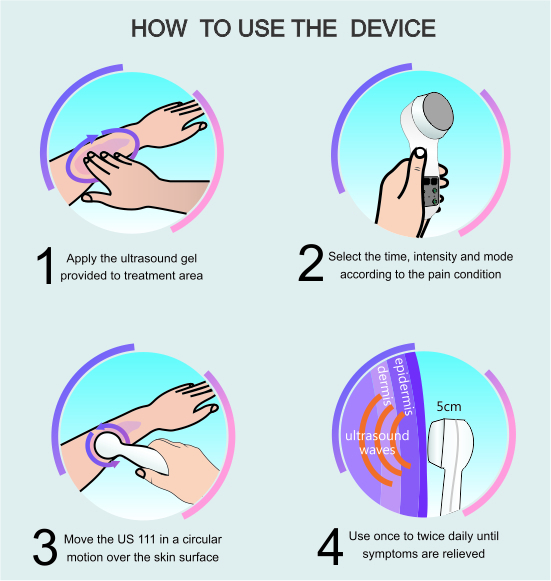 Use your US 111 device for 5-15 minutes (shorter treatments for minor pains & body areas with thin tissue, such as the wrist or elbow) and for 15-30 minutes (longer treatments for severe, chronic injuries & thick-tissued body areas, such as the back or hamstring). For the first 2-3 weeks, it is generally recommended to use therapeutic ultrasound device once or twice daily, per body part. As the pain reduces, the frequency of your ultrasound therapy sessions can be decreased to 3-4 days per week. Even after the pain is disappeared, though, we advise that you continue ultrasound applications with the US 111 physical therapy device once or twice a week to ensure that the pain doesn’t return. 5. What does US 111 feel like? 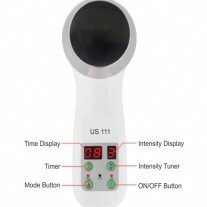 You will feel no sensation from the ultrasound waves of the US 111 during ultrasound therapy. However, there is a chance you may sense slight warmth on your skin where the treatment is being given. Keep in mind, the lower the frequency (ex. 1Mhz), the longer the ultrasound wave & the deeper it penetrates! “how to decide the intensity while using this . i am using it for neck pain .